Get the latest news and reviews in your email. Enter your details below to sign up. No longer restricted to U.S. residents; now U.K residents, and to a lesser extent Irish residents, can get paid for completing surveys and other market research work. The companies listed on this page are mainly looking for U.K or Irish residents only so don't forget to also check the international page for more sites to visit. Before joining any of the programs, consider getting yourself a separate e-mail address. Many companies offer free services, so you don't need to rely on hotmail with their junk mail problems. My own personal recommendation is Mail.com where you get a FREE email account, unlimited storage and 250+ different address choices to choose from. Right now Swagbucks is right at the top of my list. There are so many ways to earn from this site, without spending any money, with loads of bonuses to boost income further. There are several different survey categories with surveys being added continually during the day so expect to qualify for at least 1 or 2 ever day. In addition you'll earn extra points for such activities as watching videos, listening to music, searching and playing games. I regularly earn £50 a month from this site just from my own activities but US members and those who are willing to refer others can expect to earn considerably more. GlobalTestMarket has a very active survey division and requires participants worldwide over the age of 14. If you've got children under 14, you may receive requests for their opinion but the invitation will go to the parent for the child to complete, rather than to the child direct. Opinion People is an international online access panel, inviting you to participate in online studies covering current issues and get involved in the development of future products and services. You get paid for your input and also get the chance to win great prizes. After registering with opinion people and filling in a few personal details in the basic profile, you will receive your own electronic account which will be credited with your first 7 bonus points. You will then receive a further 10 bonus points for the special profiles (Household, Internet & Technology, Job & Career, Cars & Motorbikes, Travelling, Health & Wellness, Finance, Media Use, Interests & Hobbies). 1 bonus point is equivalent to 10p. When you have accumulated a total of 150 bonus points, you will receive a pay-out of £15 direct to your bank account. For every survey you participate in (even if you do not complete it if you do not belong to the desired target group), you receive a ticket for the monthly raffle, so the more often you participate in surveys, the higher the number of entries you'll have. This company only very occasionally opens the panel to new members so grab the opportunity now. If there is no banner above, bookmark the site and return later. PineCone Research doesn't allow you to sign up directly through their site but do occasionally place banner ads around the Internet from time to time inviting new members. This is one of my favourite panels so I'd strongly recommend grabbing the chance whenever you find a banner such as the one you may see above. If there's no banner visible just keep checking back periodically. Once a member, you can expect to be called upon to answer a survey once or twice a month, for which you rarely appear to get screened out. You are usually paid £3 for each one. In addition, several surveys then offer you the chance to test new products, and you're then sent a full size product to try out. I've received full size cleaning products, drinks, chips, confectionery, sauces and more. Currently recruiting UK residents between 18 and 34. Although new to me Inspired Opinions has a great pedigree, being the online community of American market research corporation, Schlesinger Associates, who have been around for nearly 50 years. They have recently expanded their operations and are looking to recruit withihn the UK. You can participate online, from your computer whenever it is most convenient for you; participate on the telephone, at times that are most convenient to you and participate in person, at one of their friendly and informal focus group venues. You'll earn Opinion Reward points for participating in research studies which can be redeemed for a reward. Once you have accumulated enough Opinion Rewards, you can redeem them for a number of rewards in denominations ranging from £5 to £100. 100 Opinion Reward points have a value of £1 and can be redeemed once you reach 1,000 points (£10). Anyone 18 years or older is eligible to join. You can also earn points for referring friends and family members. Survey Downline is an aggregator site, whereby they get survey requests from other market research companies and then split their earnings with you. This means they usually have more surveys available than the average company. You can also earn a cut for any surveys completed by anyone you refer to build up your income. Payment by Paypal or Facebook credits. One of the most prestige market research companies, The Harris Poll has been running since 1963. In 1997, Harris Interactive began developing an on-line version of The Harris Poll, Harris Poll Online where you can earn Harris Poll Online Rewards and redeem points for your opinions. Rewards include a variety of merchandise and gift certificates. Maximiles (formerly ipoints) is a well established incentive scheme where you earn points from your own on-line shopping plus points for visiting sites, completing surveys and reading e-mails. Earn from purchases of computer products, books, CDs, videos, insurance, flowers, electrical goods and more and choose from a list of products including high street and online gift vouchers, flight vouchers, and vouchers or products from the associate companies including music systems and games consoles or even an iPad. They have recently greatly increased activity their survey department and I am now getting invitations daily, generally worth in the region of 200 points a time (worth around £1, depending on gift chosen) and they always have quick surveys on the site for 5 points or more. There are always loads of free points available. I've earned myself DVD's, CD's, a £50 Amazon voucher and a music system so far almost without buying anything. If you have a smartphoneMobileXpression will reward you every month. Join MobileXpression today and earn a £5 Amazon gift card after you’ve been an active member for only 1 week. Plus, by keeping the MobileXpression software on your mobile phone you will be eligible to claim additional credits each week that can be redeemed for more gift cards! Long established respected US market research company Opinion Outpost has just launched in the UK so the company are currently recruiting UK residents from a wide range of demographics. You will always earn Opinion Points for each survey that you qualify to complete. 20 Opinion Points = £1 and you need only accumulate 50 Opinion Points (£2.50) before redeeming. The cash amount is paid to you using Paypal. In addition, some surveys may offer other payments, such as a sweepstakes or other prizes. In general, Opinion Points will appear in your account within just a few minutes of completing a survey. As long as you are an active member of OpinionOutpost your Opinion Points will not expire. To be an active member simply means that you attempt to take at least one survey every three months. Their Refer-A-Friend option allows you to invite friends and family not living in your household to join the research panel at OpinionOutpost.co.uk. They will award you Opinion Points for each person you refer who subsequently joins the panel and completes at least one survey. Open to all UK resident over the age of 18. Limited to one account per household. Toluna (formerly Test & Vote) is slightly different from other survey sites I've come across in that you don't have to rely on getting invitations for completing surveys, but have several other ways of earning points or getting free items. Subject panels - complete these to get 500 points per subject. You can either exchange your points for gift vouchers or use them to buy tickets in the monthly lottery. Visit Toluna UK to get further details and register for the UK site. By joining the iPoll panel and providing your feedback on products and services, you will have the ability to shape future products and services. Once you register on their site and tell them a little bit about yourself, your preferences will be matched to unique survey opportunities. Take as many or as few surveys as you’d like and earn rewards for your input. The more survey opportunities you participate in, the more rewards you earn! 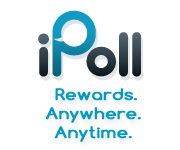 iPoll offer a diverse reward program to thank you for your time including such rewards as magazine subscriptions, Amazon gift codes and other popular electronically-fulfilled rewards. In addition to these rewards, you can also donate your reward to a wide variety of global charity organizations. iOS and Android apps also available. PopulusLive is the online research community from Populus, one of Britain's leading opinion research companies. Their clients would like to know your views on a range of different subjects - from brands to politics, from your favourite products to your views on the latest news. For every five minutes you spend taking part in their research, they'll pay you £1. When you join PopulusLive you'll also be joining an online community where you can connect with other members to exchange views and ideas. Contrary to appearances suggested by the name, American Consumer Opinion is made up of consumers worldwide who have agreed to participate in surveys over the Internet. Occasionally, these consumers are asked to participate in mail surveys or telephone surveys, but generally the surveys are all conducted over the Internet. As a panel member, you will participate in several surveys a year, typically. The average survey will take 10 minutes or so to complete, and the questions are usually easy to answer. Panel members can expect to receive a "screener" (a short questionnaire) every six weeks or so. All registered members participate in a monthly drawing to win cash awards, just for being a member. If you answer a screener (a short questionnaire), you will be entered into a drawing for cash awards and when you participate in a survey (a longer questionnaire), you will always receive some type of incentive in the form of a free product to test, cash, a check, or a gift. Incentives typically range in value from £3 to £25, per survey, depending upon the length of the questionnaire and the time it takes to complete it. If a survey is extra long, then the award could be £25 or more. Participants in online focus groups generally receive more than £25. GfK have just reopened their media panel and would like to invite you to take part in a study to give your opinions of programmes shown on television and radio, and the websites you visit. The answers that you give are important in deciding what TV and radio programmes are made and what websites are produced. It doesn't matter how much TV you watch, how much radio you listen to or how often you access the internet, it's what you think and feel about the TV programmes, radio and internet that's important in this survey. The survey is available every day. It only takes a few minutes to complete, and it's your chance to share your thoughts and feelings with the programme producers themselves. Sign up now and you will be able to start giving your opinions from tomorrow. If you complete a questionnaire at least 10 times per month you will be entered into a monthly prize draw with over 4,000 cash prizes totalling almost £15,000 to be won and a top prize of £1,500. Every three months you will be entered into a loyal lottery draw, with a total prize fund of £8,500 per quarter and a top prize of £4,000. Unlike other sites offering prize draws instead of guaranteed payment, this one has enough prizes to stand a real chance of winning on a regular basis. I tend to get a few wins every year and I only tend to complete 3 surveys a week. With more discipline I'm sure I'd win more often. Before you can participate you'll need to fill out a short survey about you and your household. Fill this in and you will receive 5 tickets towards your entry into this month's prize draw. IPSOS Interactive Services is one of the world's leading market research agencies. By joining their research panel, you'll earn points that can be exchanged for High Street vouchers. One of the more active panels - I receive survey requests most weeks from this agency. They are also one of the best for sending out new products to test. Your rewards can build up surprisingly quickly. I recently looked at my account and was delighted to discover I'd built up a balance of points worth £60 which was prompty converted to Amazon vouchers. Available to UK residents over 18 plus US and Canadian residents plus much of Europe (see European page for current European requirements). MySurvey.com (formerly MyTNS.com) offers you the chance to participate in online research and earn Nectar points or MySurvey points exchangeable for Amazon vouchers or charitable donations. I receive regular surveys to complete and even when you don't qualify you still earn a few Nectar points (usually at least 35). They are one of the best sites when it comes to longer duration surveys (eg a few minutes once a week for a month or every day for a week) which pay pretty well and for product trials. Available to UK residents and 70 other countries including Ireland, France, Spain, Germany, Italy, Netherlands, USA and Canada, although different rewards apply for each country. Open to UK residents, 16 and over. Valued Opinions, (formerly The Mobile Channel) pay you for every survey that you complete, (typically with between £1 and £2). The value of the reward can vary from 25p for taking part in a text poll, to £50 or more for attending a focus group. When your account balance reaches £10, you can exchange it with a gift voucher for one of a range of well-known high street and Internet shops, including Amazon, HMV, Tesco and WH Smith. I receive several surveys every week from this company, earning enough for a payout nearly every month as well as test products. Open to residents 16 and over. Opinionworld UK - Become a member of OpinionWorld and receive regular invitations to take part in interesting surveys and opinion polls. Each time that you take part you have the chance of winning instant prizes, entries into the monthly prize draw, and the opportunity to support charities. Cash payments are also made on many surveys with payment made individually by Paypal rather than having to reach a minimum payment, even if you only earn £1! Every time that you take part in a survey some money is set aside for a charity; the actual amount depends on the size of the questionnaire. The greater the number of people who take part, the more money donated. Charities change on a regular basis and include multinational charities and smaller organisations - just state at the end of the survey which charity you wish to support. Page 2. Page 3. Page 4.Page 5 Page 6.